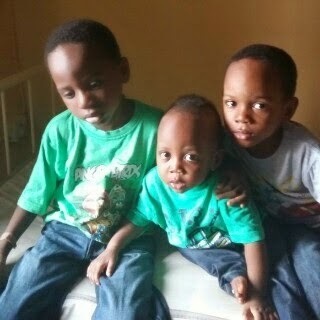 Three brothers, Aderomola Orekoya, 11 months, Demola Orekoya, 6; and Adedamola, 4, were kidnapped by a new nanny, Mary Akinloye, just over a week ago. The children have now been found and were reportedly left by the fleeing kidnappers in an uncompleted building in Egbeda/Shasha area of Lagos, Tuesday night, after some ransom was paid into the kidnapper's account. According to SDK, "the kidnappers were paid N2.5m and they used ATM to withdraw 100k and transferred N1m each to Skype Bank and UBA". This probably led to the arrest, last night, of the nanny, Mary Akinloye who was paraded earlier today, you can see her pictures here. The Lagos State Commissioner of Police, Kayode Aderanti confirmed the arrest this morning while speaking on Channels TV, saying that Mary was arrested last night but didn't disclose the location. Details of the arrest is still sketchy but it is suspected that the police traced the suspect with the ransom paid by the family. It is also expected that the arrest of Akinloye would lead to the apprehension of her gang members who connived with her to perpetuate the dastardly act. Vanguard reports that the children were rescued an elderly man, who was the first to notice the presence of the children behind his house at about 8pm on Tuesday. The father of the children, Mr Adeleke Orekoya, reportedly said the man then quickly alerted the police who took the children into custody and then called the Orekoyas to come and identify their children. The children were then taken to the Nigeria Police Hospital, Ikeja, Lagos for treatment for malaria and malnutrition. They were reportedly abandoned by their abductors for fear of being arrested by the police team who had been on their trail since last Wednesday when the abduction happened. “It all started after my daughter, Adebisi Orekoya, applied for a nanny through OLX (an online sales portal). On Monday (last week) one lady, who identified herself as Mary Akinloye, came for the job. “My daughter took her to her place of work to introduce to her colleagues. Next day, Tuesday, she resumed work. But on Wednesday, she took my three grandchildren, leaving Michael, the eldest, a boarder who was on holiday, with information that she was going to get something. “When Michael did not see Mary and his siblings, he contacted his mother by phone. My daughter in turn called her husband, who had to cut short his trip to Ibadan and return home. “We went to Surulere division and Area ‘F’ to incident the case. Efforts to reach Mary on her phone proved abortive, as it was switched off. But she called next day to say she was with the children and demanded for ransom of N15 million. “Since then we have been running from pillar to post looking for how to raise the money. Public-spirited Nigerians, family members and friends contributed. “Aside that, we did not relent in prayers. There was no church around this area that I did not visit for prayers. In fact, in one of the prayer sessions, prophesy came that we would find the children today (yesterday). “When Akinloye reported to work, she took her to her office around 8am. She told her co-workers, ‘see my new nanny’, and they were all happy to see her. An elder sister to Mr. Lere Orekoya, Mrs Adesumbo Alabi, stated that when news of the disappearance of her nephews reached her, it was like a dream. The children's aunt said the family was happy that the children were returned hale and hearty. “At first , it seemed like a home theatre movie. I never believed until I came and saw my brother’s wife crying. I really appreciate my brother’s courage during this period because he encouraged us not to cry, that anything that happens to one in life is for a purpose. When I came here and saw the situation on ground, I couldn’t hold back my tears. Even while we were looking for the kids on Sunday, we did thanksgiving after praying for hours, believing that the children will be back to us. She said the family was able to pay the ransom through the contributions of members of the public and relatives, who responded to the family’s distress call. “We thank God the kidnappers asked for money, because there are cases where kidnappers don’t even ask for money, and the next thing you hear is that their captives are dead. But these ones asked for money, and the children are back. “Many people supported us with money. The appeal we made through the Facebook, television stations, radios, newspapers, were not in vain. But I don’t think the kidnappers were able to collect all the money they asked for. 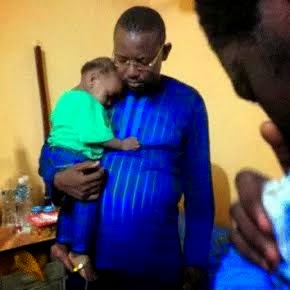 At the hospital , Mr. Orekoya was seen rocking Aderomola, the youngest child, to sleep with a lullaby: Row, row, row your boat, gently down the stream. While Aderomola was on drip, the other two were playing. The children described the kidnappers’ hideout as their new home, saying Mary cooked the meal they ate. Mr. Orekoya, stated that the rescue of his children was an indication that prayers worked. “In one word, I will say that prayer works. We are happy that they are alive and well."